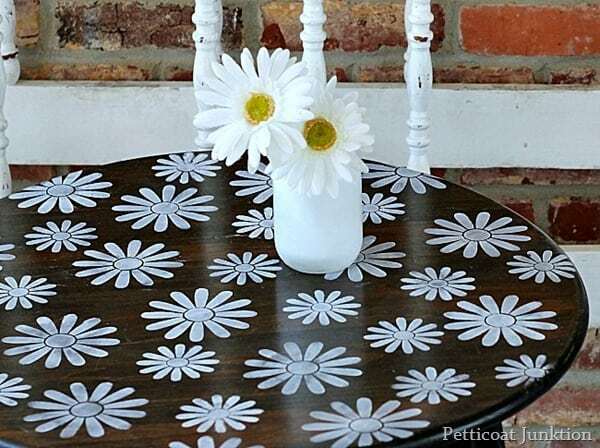 This stenciled white daisy table is too cute for words. 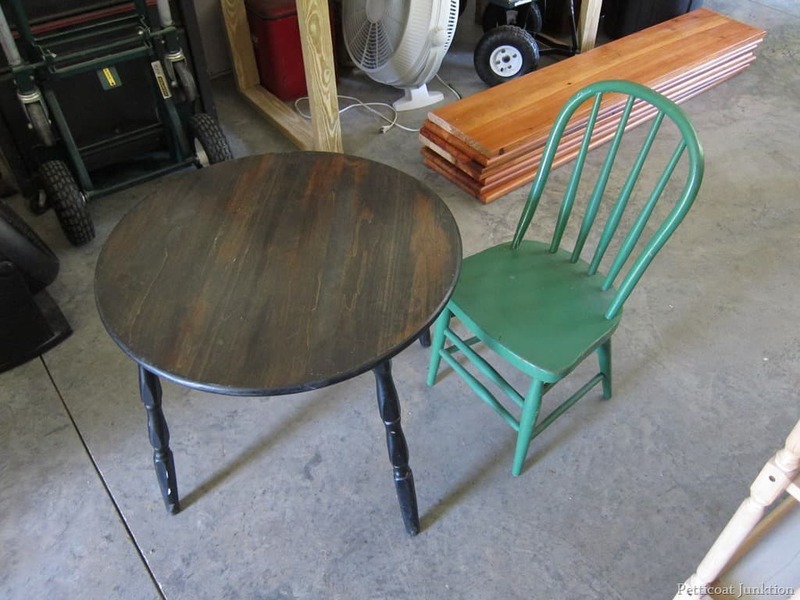 Sometimes you can showcase the original furniture finish with touches of paint and this project is a good example. It was also super easy and I have all the details for you. The table I stenciled belongs to Miss Sofi. I stenciled the table and painted her chair….she doesn’t like change….unless it’s her idea. I could be in big trouble. You have to admit….that table is cute. I think Miss Sofi will like it. 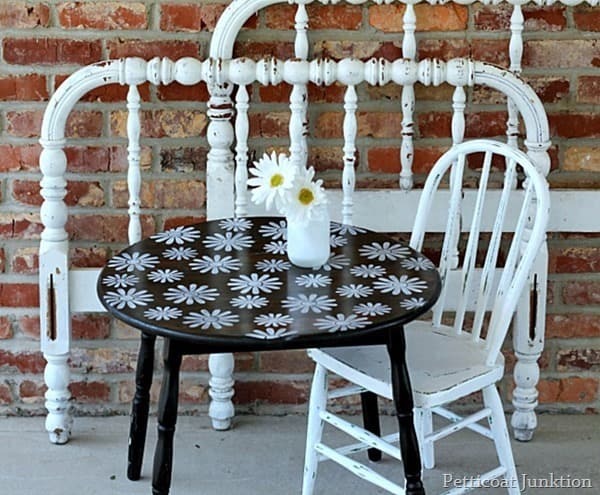 The contrast between the white paint and original dark finish of the table is just perfect. I bought the kid’s table months ago. I don’t even remember where it came from. The chair came from a local antique/flea market shop. The table is in the Owen Workshop and Sofi uses it to paint her masterpieces. The chair has been with her desk in the house. She noticed the chair had been replaced with another but we were able to gloss over that and move on! 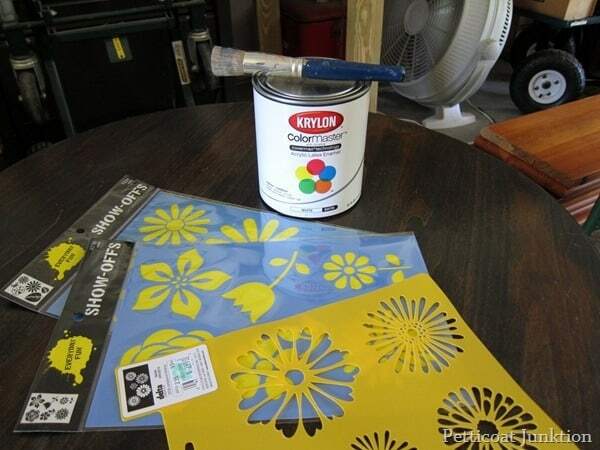 I found the flower stencils at Hobby Lobby and got a brand new can of Krylon White Gloss paint for the flowers. The glossier the better. Paint goes a long way when stenciling. Really, it just takes a tiny bit. I poured a little paint on a paper plate then dipped the brush in the paint and wiped most of the paint off on a paper towel. That’s how you do it. The secret to stenciling is a dry brush….read a complete tutorial by clicking here. I planned to use different flower designs but after contemplating (big word) it for a while I decided just to use two different sizes of the same design. I stenciled them on willy-nilly, no measuring or anything. When stenciling designs I usually run some of the design off the edges or overlap designs. Chairs are not my favorite thing to paint. There are usually a lot of rungs or curved details. 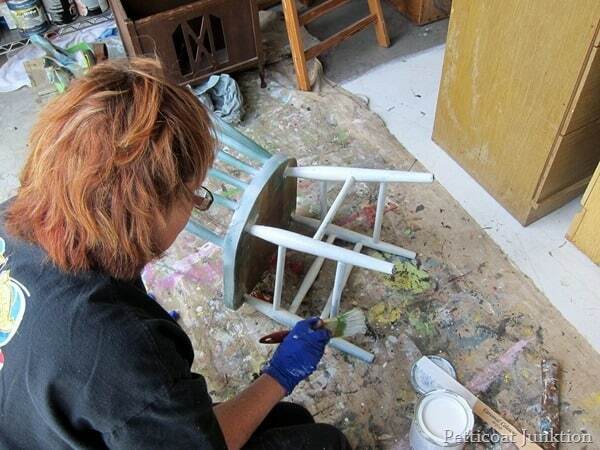 I usually try to give the chair a coat of spray paint before I brush on a coat of paint. The spray paint gets into all the joints better. 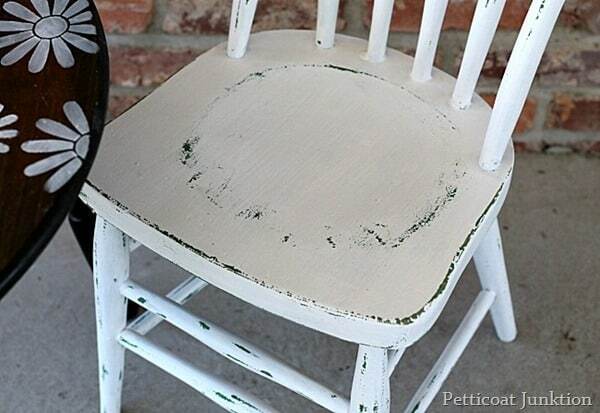 I used the same white Krylon paint for the chair that I used for the stenciling. The JTS got ahold of the camera. There’s a reason I don’t post photos of myself working on projects in the workshop. I distressed the chair and the original green paint shows through a little. I did the distressing with an electric palm sander and 100 grit sandpaper. 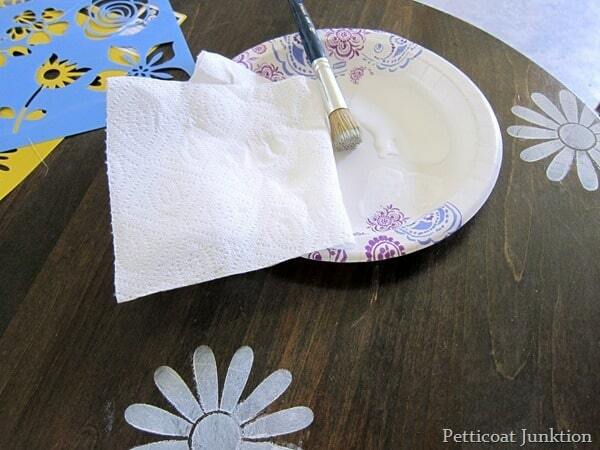 My first thought was to give the table an overall paint job in a bright color and stencil bright flowers all over it. I’m glad I worked with the original stained finish. The little table is a class act now. What do you think of the stencils and the white paint? Sofi likes her table. I wasn’t there when she first saw the table but I’m told she put both hands over her mouth and said “I can’t believe it”….she’s not dramatic at all 🙂 She didn’t want me to take her picture so I had to sneak around to get this one. 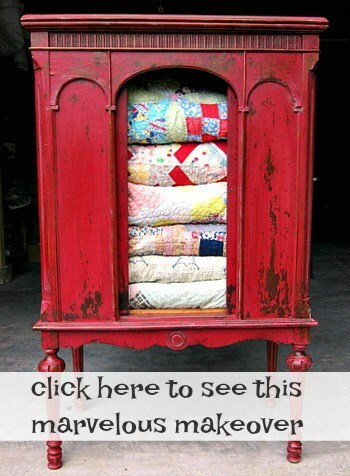 This post first appeared on Petticoat Junktion in May 2014. The post has been updated and reshared for those of you who missed it the first time. 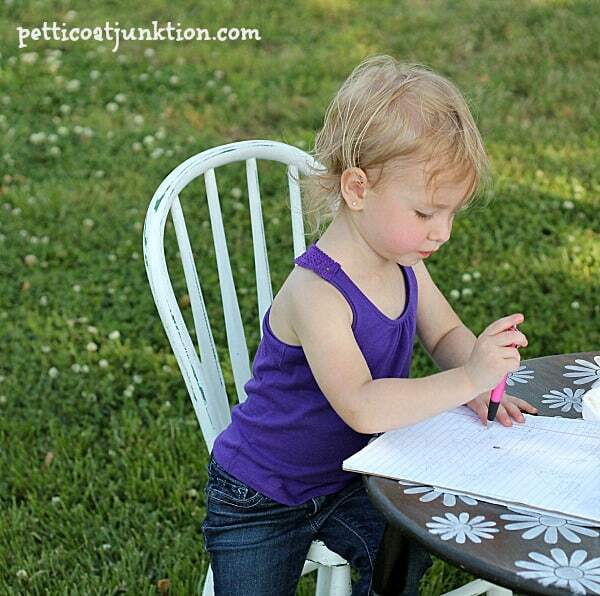 DIY crafts can be so fun and rewarding, thanks for sharing on your blog! 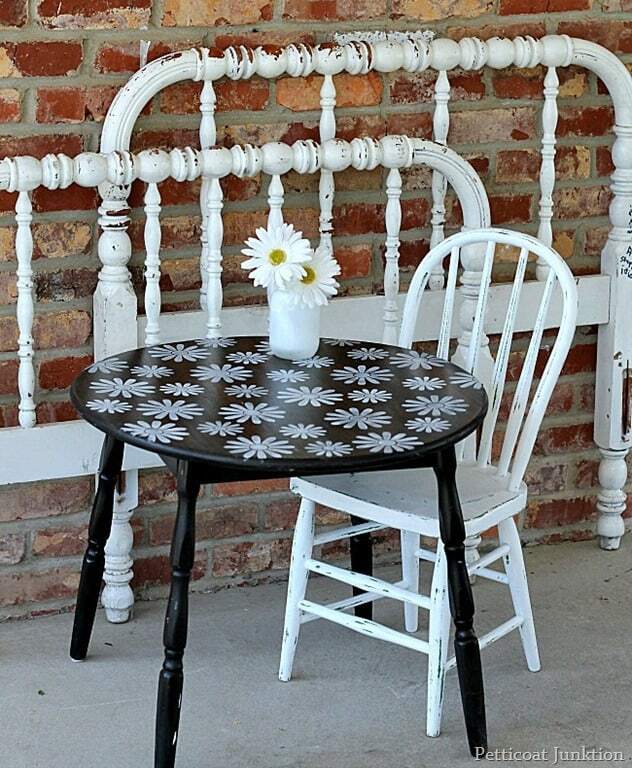 When I first saw the picture I thought the table had been painted in a black lacquer with the white daisies on top. I thought that looked amazing! It wasn’t until the end that I realized it was the wooden table. That also looks nice but I think the black lacquer would have looked even better, sorry LOL! Good job! Thanks Hannah! That would look cool. Super cute.. I see the original post was in 2014 – 4 years ago. Does Miss Sofi still have the table & chair? She sure is a cutie!!! The Grands are the best for sure! I sold the table a while ago. Sofi is too big for it now. Yes! The Grands are the best. Wow!Thanks Kathy,you truly made my day. I have never has anyone respond on a blog before and it felt like someone famous wrote me a note. The first time I picked up a hammer and made something I couldn’t afford otherwise, was the beginning of a new chapter in my life. I do wish you luck, but I know with perseverance we women can accomplish anything. By the way when I taught myself to woodwork I was 50 something. 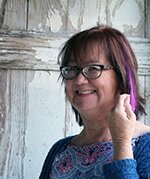 I’m now 65 and still have the passion. Isn’t it great to be a gram? I love doing things for my grands and great-grands. I follow Ana White, using her plans to build them things then decorating them. Now I’ll be following you for ideas too. Keep up the good work. Thanks Pam. Anna has a kids playhouse plan that I’m thinking for doing. I’m not much on building things so wish me luck. Thanks for the nice comment!!! Oh I love it and I think your granddaughter will too! 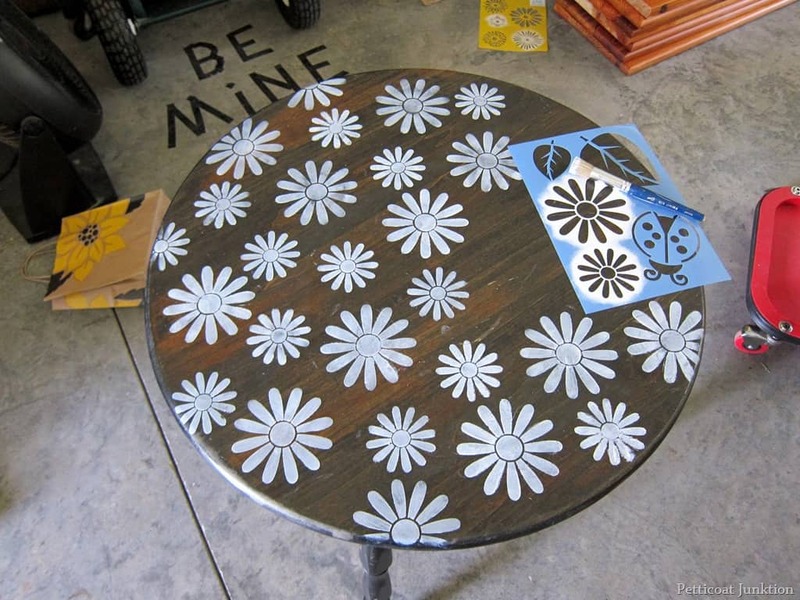 Your stenciled daisies & willy nilly ;)effect are so pretty on top of the original finish. i really luv this set!!! i did almost the same thing with a chair that a neighbor gave me….it was old and beat up so, i painted the whole chair black and applied gold polka dots on the seat and the top piece …luv it! Sofi will love it! It looks so fun and perfect. I am inspired by your ability to see beyond what you have. Just absolutely lovely, Kathy. Kathy, I love it! It is adorable. What a cute tble for Sofi to enjoy for artwork. I know she will love this! The table is absolutely adorable! I love it! So simple and cute and it looks perfect with that cute little chair. I hope Sofi likes it, too! I love it Kathy! The white stencil over the stained wood is lovely!! It is so adorable I hope she loves it! Let us know! OMG that table is to cute, I want it. Pinning!! !